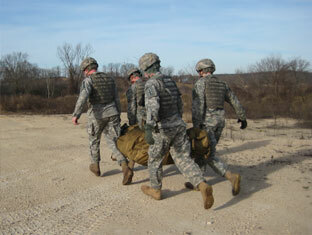 APLS Rigid is a lightweight portable litter that provides the structural benefits of a traditional military litter, but improves the evacuation and transportation of injured personnel, including in remote, rugged locations. Weighing half of a traditional NATO litter, APLS Rigid combines a rigid, expandable infrastructure and a highly absorbent cellulose core to form a truly unique, state-of-the-art litter system. The absorbent core contains and controls blood and bodily fluids, thus increasing patient comfort while reducing the risk of cross contamination. A treated nylon backing protects against wind and moisture, while a Mylar lining holds in heat and protects against hypothermia. APLS Rigid quickly expands from a 19" x 14" x 4" package into a full-size rigid litter, ideal for rapid evacuations of injured personnel, particularly in remote, rugged locations. 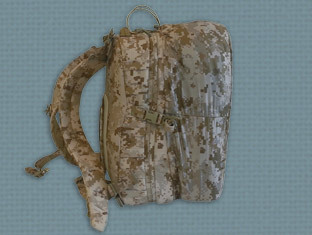 Rugged and compact, APLS Rigid can be easily carried into the battlefield in a medical bag. Photo Courtesy of U.S. Marine Corps by Cpl. Reece Lodder.